RUSH: Folks, I have to continue to thank you. We had another bang-up week last week with people downloading the Rush Limbaugh app and becoming members at RushLimbaugh.com. And I want to stress something. We are at peak. Every week now we are setting a record, all-time record for members of Rush 24/7. And I cannot tell you how gratifying it is. But I want to continue to emphasize, the Rush Limbaugh app, you don’t have to pay anything to use it. You don’t have to pay anything to get a lot from it. Now, the one thing with the app, either on the iPhone or if you have a Samsung or Android phone, you don’t have access to audio or video streaming, the Dittocam or audio streams, but you do have access to all of the transcripts. Now, the transcripts of every segment here are, in essence, the same as blog posts or columns, except I don’t write them; I speak them. And then they are transcribed. And if we have time, we clean them up, punctuation, grammar here and there. But I use a lot of words. I say a lot of words. Our transcribers are working feverishly just getting all the words down. We try to get these transcripts up as quickly as we can. Now, the benefit to having transcripts is that it’s much easier to share them. For example, you hear something on the program that you like, that makes a lot of sense, that’s something you may not have thought of before and you want to tell somebody or a bunch of other people, you don’t have to remember it now. 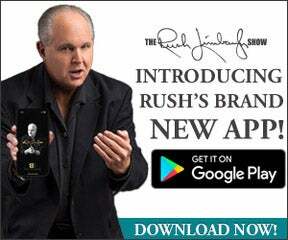 All you have to do is go to the RushLimbaugh.com app or the website and share the transcript with whoever. And then tell ’em where in the transcript the item of interest is, because these are long monologues, and the transcripts can be rather lengthy too. But it’s one of the simplest ways to spread the word. There are other areas of the website that are available totally free, and one of those areas contains video, video highlights of the Dittocam, video highlights of some of my old TV appearances, video highlights from the old Rush TV show from 1992 to 1996. So there is video, just not live streaming of the Dittocam. There are also podcasts that are available to members, and we’re working on a much easier intuitive way of signing up for those. But podcasts were one of the first things that we began offering long before podcasts became the big deal that they are now. Our podcasts are every hour of the program. There are three of them each day, representing each hour. There are no commercials, and so each hour you can listen to it in 40 minutes. It’s encyclopedic, the amount of data or the amount of information that is discussed here and imparted is voluminous! And you have access to all of it! And, by the way, in the transcripts, if I’m bouncing off of things that I’ve seen in the news, the links to those things that I used are part of the transcript so that you can, if you wish, fact check. And if somebody says, “Well, yeah, he said that, well, how do you know it’s true?” There’s the link right there where I got it. And those things are easily shared. So what’s happening is we’ve redesigned the app. It’s one of the reasons why it’s being downloaded on so frequently. We’ve redesigned it. It looks great. In fact, in part it was specifically designed for the iPhone X and the new OLED screen there. We’ve designed it with a basic black base background color because on an OLED screen, that uses the least amount of battery life because a black screen, black areas of the screen, no power is used to illuminate, so it’s not as much stress on the battery. But even if you don’t have an OLED screen, if you don’t have an iPhone X, it still looks really, really good. So I just wanted to spend another few minutes here to acknowledge this and thank everybody for downloading the app in record numbers, signing up for memberships, ’cause it’s exciting. As I said the other day, it is replicating the experience of way long ago when we were adding new stations every week. It’s a sign of the growth that’s taking place, of the excitement surrounding it all, it’s a way to chronicle it and acknowledge it. And if I don’t tell you, who will? If I don’t tell you that we are at a record number of subscribers, record number of downloads, who will? The Drive-Bys won’t. And I definitely want you to know. So, again, heartfelt thanks. Much gratitude. But also, it’s really valuable. Twitter is, you know, shadow banning a lot of conservative comment, meaning people posting it don’t even know it’s sitting there not being linked anywhere. The guys at Project Veritas, James O’Keefe, did a great job, secret videos inside Twitter. And they discovered shadow banning. Basically what that is, you post something on Twitter and Facebook, whatever, you post it, and you expect it’s gonna be seen, maybe retweeted, followed. Nobody sees it. It looks to you like it’s there; you posted it. But they’ve shadow banned so nobody else ever sees it. And if you don’t notice that there aren’t any reactions to it, no likes, retweets, or what have you, if you don’t notice that, then you’ll not know it’s going on. Well, being able to share our transcripts here is a way of subverting the shadow banning and other attempts to silence conservatives in other areas of social media. And people are doing it. We have ways of knowing, although we don’t track you individually. And we are constantly updating the app, upgrading it to make it an even better user experience. It’s a constant, ongoing thing. And I will let you know each time we do.